At the request of Colleges, Sabre has developed a range of Solar PV rigs that can be wheeled out into the sunshine so that students can be trained and assessed on a complete working system. These have been designed so that they can be moved through standard door openings and the panels can be securely stored on the rig when not in use. 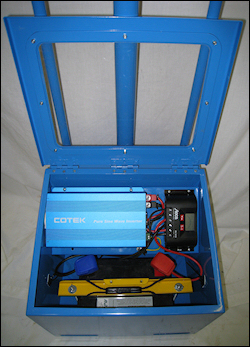 This rig is designed to mimic a working PV installation and readings can be obtained to measure the performance of the system in different locations and various weather conditions. 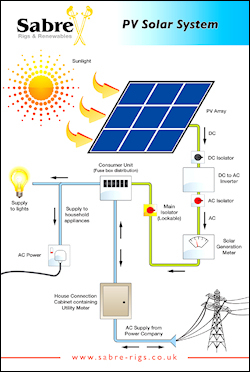 Solar Photovoltaic PV1 - a 'Grid Tie' system where electrical power is generated by converting solar radiation into 12v DC electricity which can then be fed back into the national grid via an inverter as 230v AC. Compact Design enables ease of movement through standard doorways (Minimum Width 1500mm) and takes up less on-site storage space when not in use. 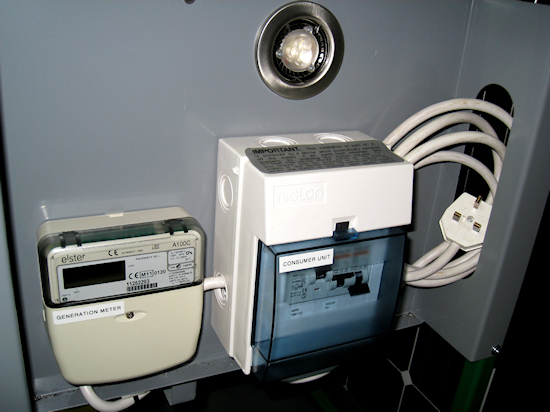 Key components (Inverter, isolation switches, generation meter, consumer unit, etc.) mounted on recessed panels to protect against accidental damage whilst being moved. Two mounting positions for PV Panel: During storage and transit, it fits snuggly against rear of frame in portrait position, held securely by an adjustable strap. A baffle strip protects panel and eliminates vibration noise during movement. During use, the PV panel is supported in landscape position by an angled work top and held in place by lower (fixed) and upper (swivel) retaining brackets. Low-level front tray - useful for temporary storage of irradiance meters, test equipment, tools and note pads etc. during use. Key components in close proximity, mounted on fixed panels, which are readily accessible ideally lending itself to training/assessment situations. 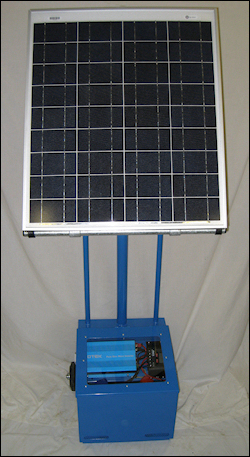 A mobile ‘stand-alone’ rig comprising a pole-mounted 65w PV panel assembly. 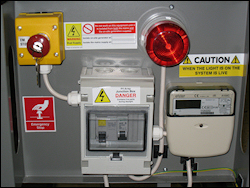 The panel is connected to a 12v deep cycle AGM battery located within the enclosed base of the rig. The lid is hinged to provide easy access and incorporates a large Perspex viewing window. Located on a shelf within the base unit is a voltage regulator which prevents the battery from overcharging and provides deep discharge protection. Adjacent to this is a battery inverter to convert 230v AC in order to run small appliances. 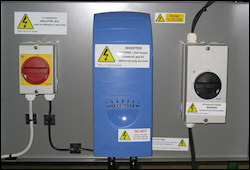 Plug-in access to the inverter is provided through the side housing of the base unit. 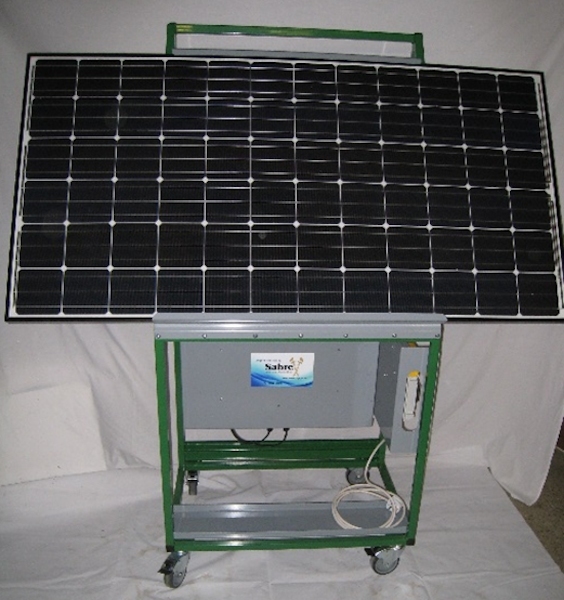 The PV Off-Grid system is supported on a 2-wheel frame to provide mobility across uneven surfaces. The support pole is in two sections which are secured with a locking pin. Removal of pin enables the panel to be swivelled into different positions during testing. The locking pin should be replaced before moving rig. The Perspex viewing lid also serves to protect the components from dust and moisture. Performance of the Rig can still be monitored with this lid closed. 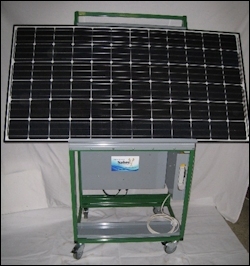 This "off-grid" rig can be used in remote locations, e.g. the middle of a field, to power various appliances. Providing the sun is shining the battery will recharge whilst it is being used. 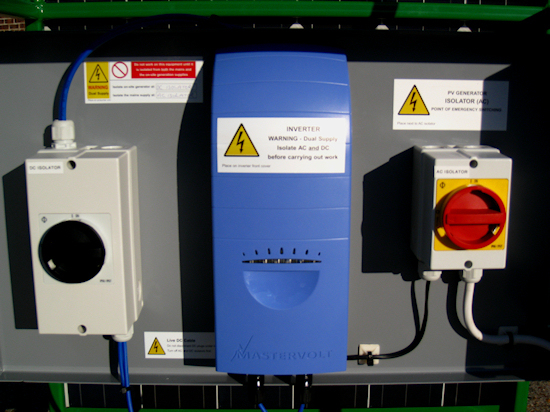 The solar charge controller (voltage regulator) allows monitoring of the load and charging current.